We love social games. As a company that works with many game developers, we need to understand the games to effectively advertise them (i.e., we have excuses to play games at work). And, let’s be honest, what’s better than beating a friend at a Facebook game, and having the news published for all your other friends to see? Naturally, we were excited to get our hands on the Casual Games Association’s 2012 Casual Games Sector Report. 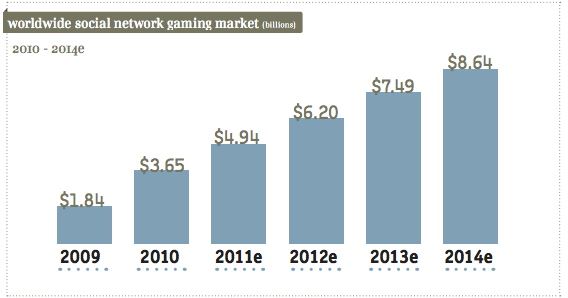 The US social gamer audience is expected to rise to 78 million people in 2012, up from an expected 69 million in 2011 and 57 million in 2010. Needless to say, the industry is booming. With an average age of 40 for women and 37 for men, social games are capturing a much wider audience than traditional console games. So, what really is a “social game”? The Casual Games Association describes them as games which “run on a social network; they typically require the player be online, run embedded in the social network’s pages, and use social features as deeply integrated gameplay elements.” Essentially, a social game translates to a game that has been integrated into a social platform such as Facebook, which allows a user to play with and against other users, and publish their high scores to the social platform. Obviously this is a huge market. Zynga, the largest developer on Facebook, has over 46 million daily active users (DAU) and recently went public. And a host of other developers such as EA and Wooga are experiencing huge growth, as well. But what are the primary monetizing forces of the industry? The breakdown is as follows, according to the Casual Games Association: 20% advertising, 20% offers, and 60% virtual goods. Most social games operate under the freemium model, where it is free to play the game but there are optional upgrades, extra content, and other types of virtual goods sold in-App to users. Though only about 1% to 5% of social gamers purchase add ons, within this market developers rely on so called “whales” who spend over $25 a month — and some who spend thousands of dollars a month. Whales only make up 15% of the paying customers, while the majority of paying players spend between $1 and $5 a month. And this adds up. Social games are experiencing a surge in users and revenue. Revenue is expected to grow to $8.64 billion in 2014, up from $4.94 billion in 2011. Much of this growth is heavily tied to emerging markets. High speed internet access and smart phone penetration are the primary enablers for new gamers in these emerging markets. This is seen in the growth of Brazil and Russia’s social gaming market as each is expected to grow exponentially within the next year from their 2010 numbers: 58% to $171 million in Brazil, and 51% to $110 million in Russia. While there are other social gaming platforms, Facebook is clearly the dominant force. Revenues are expected to increase to $2.79 billion in 2013 on Facebook, up from $1.31 billion in 2010. 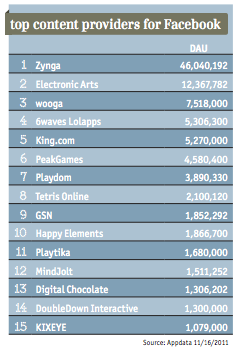 Zynga alone netted Facebook 12% of its total revenue in 2011. Social gaming is clearly a hot sector. Do you think it will continue it’s rise in 2012, or begin to plateau? Let us know in the comments!